When you weren’t looking, I jaunted off to the south of France last week. Every cell of my body is now officially made of baguette and chèvre. There seem to be many stereotypes attached to the French people, but so many of them are true. They carry bread around. They drink wine at lunch. And they are fiercely passionate about their food. Although breakfast consisted of little else than bread and butter, which I was forced to rediscover, is impossible for me to function on, there were epic lunches followed by dinner feasts that basically lasted until someone would pass out from overconsumption. Not a sustainable way to live for this girl – and we all know my sanity is greatly compromised on a diet of white flour. But of course there were vegetables eaten. In fact, the markets were a busting at the seams with the freshest and most beautiful produce I’ve ever seen. And the amazing thing about the Provence region is that there is literally a market every single day of the week. So after eating air for breakfast (baguette), we took a trip to some perfect little village nestled in the hills and I was able to replenish my vitamin stores. Thank goodness. There are a few great sins in my culinary world and one of them is over-cooking vegetables. Oh my broken heart! Limp asparagus makes me seriously sad. If you ever invite me over for a meal, please don’t serve me a plate of mushy, gray peas and flaccid carrots. I will politely excuse myself and run away. No pressure. So there are two ways I like cooking asparagus: grilling and roasting. With boiling or steaming you not only run the risk of overcooking, but also many of the minerals are pulled out into the water during in the cooking process, which you end up pouring down the drain. One thing I found a little funny about the people we were staying with in France is that despite their unbelievable passion for food, they seemed to love over-cooked asparagus. Huh? I took control one afternoon and grilled it up. Everyone was delighted at the difference it made. Roasting and grilling keep more of the nutrients in while maintaining the crispy crunch of al dente perfection. Because the veggies are not submerged in water, they cook slower and you’ll have a lot more control. I remember seeing white asparagus in Canada, but for some reason I never gave it a try until moving to Europe. People go absolutely crazy for the stuff over here! I read in a paper a couple weeks ago that the typical German will eat it every day while it is in season. Now that’s love. 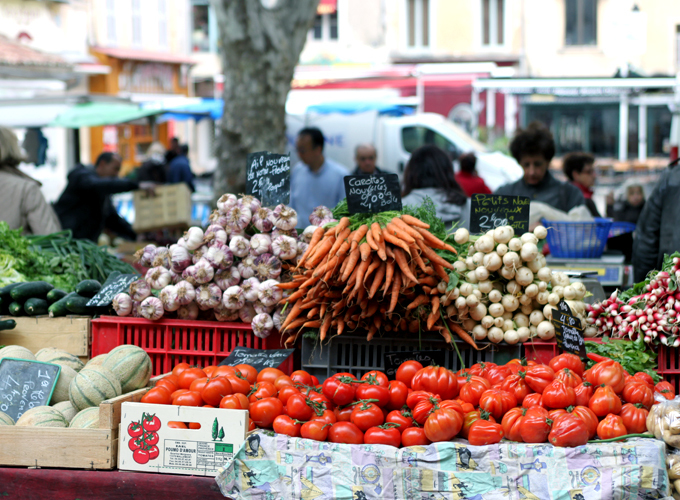 And while in Provence, there were walls of it at every market – it was an incredible site. White asparagus is often referred to as “edible ivory” or “the royal vegetable” and regarded as far superior to green asparagus. I admit I’ve fallen in love too. 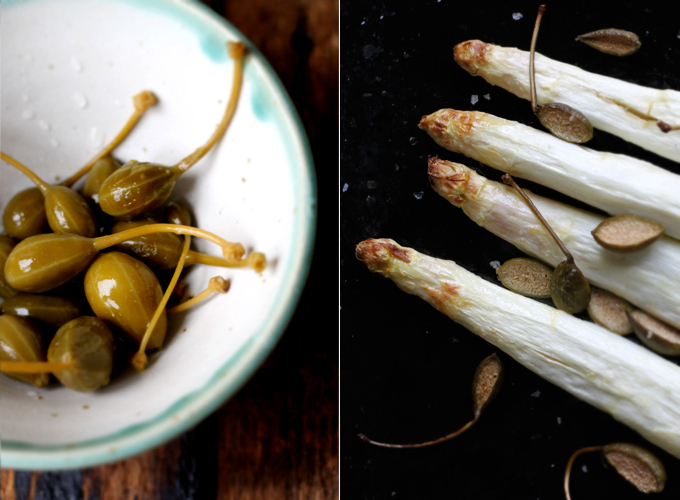 White asparagus really is something special. The flavour is of course very similar to the green variety, but milder and less bitter. It is nutty, succulent and satisfying, which is why three of four thick spears make a substantial side dish. White asparagus also tends to be thicker, often double the thickness of a green stalk. White asparagus is grown completely underground, a process called etiolation. The spears are deprived of light by continually mounding the soil on top of them as they grow. This prevents the plant from producing chlorophyll, thus there is no green colour to the stalks. In some cases, if the stalks do break through the earth they will turn green where they are exposed to light, resulting in a white-and-green stalk that is of less value (but still delish!). When buying white asparagus, take a careful look at the cut ends to make sure they are not dried out. You should also choose the thickest stalks, as once they are peeled, you still want a good portion of the vegetable left over. Peeling white asparagus is necessary because the outside is fibrous and quite woody. Use a very sharp peeler, or paring knife if you having nothing else. Be very careful when handling and peeling, as white asparagus is far more delicate than green, and can snap easily. White asparagus does not keep well so eat it within two days of purchasing. Store the unpeeled stalks in the fridge, loosely wrapped in a damp towel in the crisper. Vitamin K plays a vital role in many bodily functions. It allows your blood to clot normally, protects your bones from fracture and postmenopausal bone loss, helps prevent calcification of the arteries, and provides possible protection against liver and prostate cancer. Research continues to evaluate the possibilities of vitamin K’s role in protecting against oxidative damage, regulating the body’s inflammatory response, and how it supports the brain and nervous system. Just 130 grams / 4.5 oz of asparagus provide nearly 70% of your RDI for vitamin K. Even better sources of vitamin K include kale, spinach, collard greens, Swiss chard, and Brussels sprouts. White asparagus it is typically served drowning in Hollandaise sauce or mayonnaise, but you know that doesn’t really fly with Sarah B. I chose to dress this veggie with a creamy, yet vegan, Mustard Dill sauce that compliments the asparagus’ delicate flavour, without overwhelming it. I also craved a briny accompaniment and decided to toss some caper berries in the roasting pan for kicks. Hel-lo! Guh. These were so delicious I almost can’t believe it. I had never even heard of roasting caper berries before so this was a revelation, and something I will add to many roast vegetable dishes from now on. If you cannot find caper berries, use the fattest capers you can find and leave them whole. 2. Wash and trim asparagus (snap off the ends instead of cutting them – this ensures that you remove the woody bottom parts which differ from spear to spear). Peel the spears from top to bottom to remove their stingy outer portion. Drain the caper berries and slice in half lengthwise. 3. Place asparagus and caper berries on a baking sheet and drizzle with ghee or oil. Sprinkle lightly with salt and place in the oven. Bake for 10-20 minutes (this will vary depending on the thickness of the asparagus) until slightly golden at the tips and al dente – tender, but with some tooth. 4. While the asparagus is roasting, whisk all the dressing ingredients together. 5. Place cooked asparagus a serving tray and drizzle with the Mustard Dill Dressing while still hot, sprinkle with more salt if desired. Garnish with springs of dill. Serve immediately. I have plenty more to say about my unbelievable trip, but for now I’ll leave you with delicious recipe and the promise of more gorgeous, Provençal-inspired recipes to come! And seeing as we’re headed into strawberry season, check out my full article and recipe for Strawberry Tarts with Ginger-Nut Crust (and a high-vibe chocolate truffle) in this month’s issue of Bon Appetit magazine. You can also find the recipe online here. Enjoy! Pingback: Game of Thrones Feast – the cursory cook. Thank you for sharing the article. Very useful for me this novice . Living in Switzerland at this time of the year means for me asparagus and strawberry time: I get the veggies and berries directly from local farmers. My family likes both white and green asparagus. Last night I made your recipe and it was a hit! Thank you so much for sharing it. However, I must say I had to bake asparagus 40 minutes instead of 10-20 min. Hi Sarah, I found your blog after making some serious diet changes and it’s been a lifesaver! I discovered white asparagus years ago while living in Los Angeles – a restaurant near my work had a cream of white asparagus soup special when it was in season, and I was completely addicted. When I moved back home to Denver, motivated by insane cravings for this soup, after much trial and error, I found this recipe http://www.food.com/recipe/spargelcremesuppe-cream-of-asparagus-soup-422686 which is a pretty close approximation of the soup I had in LA. But it contains white flour, cream and butter. I’d love it if your brilliant mind devised a vegan version. 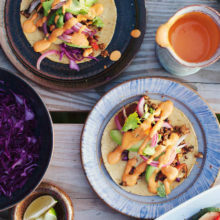 Thanks for all your amazing recipes! Looks great Sarah! Glad to see someone else who understands the glories of roasting white asparagus. It is such a special vegetable that really benefits from slow cooking – the final texture is unbelievably juicy! Thanks for sharing. Thank you, thank you, thank you for the mustard dill sauce recipe! Been looking for ages for something both tasty and healthy (read: NOT butter) to put on vegetables. Your website is not only beautiful and inspiring, but a true public service! You can chill the truffle ‘dough’ before rolling them if it makes it easier to handle. All dates act a little differently, and in my experience I didn’t need to cool the mix down first. I got this issue the other day (so beautiful!) 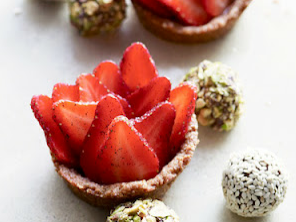 and I have been wanting to make your truffles (and also next, the strawberry nut tarts), so I’m doing that right now! I did have a question about the process with the truffles: do I need to chill them prior to rolling them in the outside coating or was that just directions for the make ahead? already sampled the date puree and it’s soooo good. Living in Munich, I can certainly attest to just how much Germans love this white-ivory-like vegetable. My local farmer’s market even has pop-up stands selling only white asparagus (and sometimes packages of Hollandaise sauce or a vegetable peeler). It as if some farmers are completely devotional to it. Thank goodness for a Sarah B. version! I, too, am quite taken by the white variety and am so happy to see a creamy interpretation that does not involve Hollandaise sauce. Can’t wait to try this recipe! I used to help out my neighbors at their asparagus farm in MN. I didn’t know how great it was until then. I’ve never tried the white, but after your description it’s a must. Thanks! I always thought white asparagus would be less nutritious because it’s not green, but it sounds like it holds a pretty healthy dose of vitamins too. I love the salty kick of capers and caperberries so will definitely be making this dish. Hi Sarah,I’m spanish food blogger, I love your blog!!! I recommend you to try asparagus with fresh ginger and black olives. Where to begin? I’m so glad you enjoyed your stay in France. We share the same inability to function on white bread—I vividly remember feeling terribly shaky and desperately hungry in Paris after eating our hostel’s breakfast of baguette and butter. I have never tried white asparagus, but if I find some, I’ll know what to do with it! P.s. 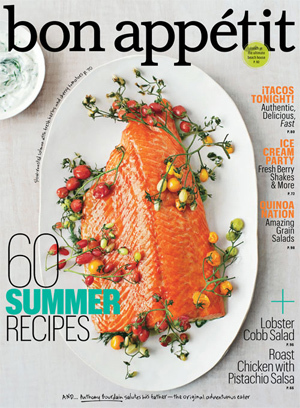 congratulations on your Bon Appetit article! I have not looked through my copy yet so I had no idea. Can’t wait to try those beautiful strawberry tarts! I also lose my sanity on a white flour/white sugar diet! Happy to hear someone else has a similar experience 🙂 Markets daily and gorgeous veggies, that is joie de vivre! i never knew anything about white asparagus! i find the way it is grown fascinating. i can’t wait to give them a try as i’ve never eaten them before. i’m also glad i read this beforehand as i didn’t know it was supposed to be peeled! I’m glad you had fun in France! lucky you! 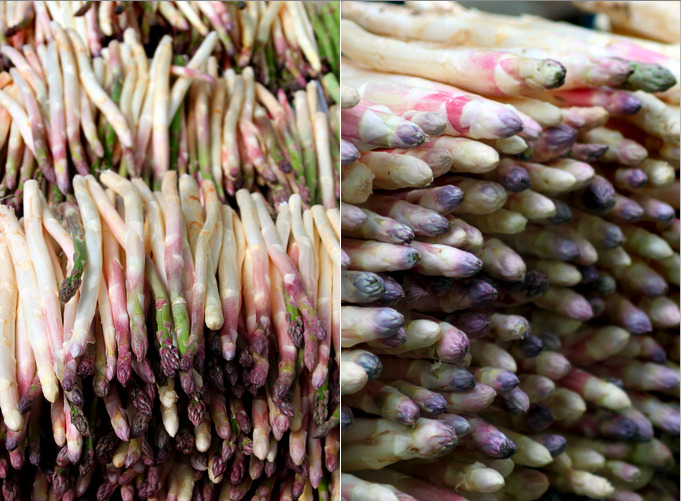 that white asparagus is gorgeous! roasting veggies is my favorite way to prepare them! i’ll have to try your dill dressing! sounds delicious! thanks for sharing! How creative! Asparagus is one of my favorite veggies. That dill dressing looks like the perfect compliment to the unique flavor of the asparagus. I just made it: it is absolutely delicious!! A welcome change to my beloved minimalist version of white asparagus with browned salted butter. Thank you! Sarah, is there any way to prevent the sauce from separating? Within moments after drizzling it over the warm asparagus, the oil separated from the mustard-base. Not that it did damage to the taste, absolutely not, however, it would look even prettier if it stayed creamy. O la la! I love white and green asparagus!I ‘ll try this recipe! I’m waiting for another inspired France posts! 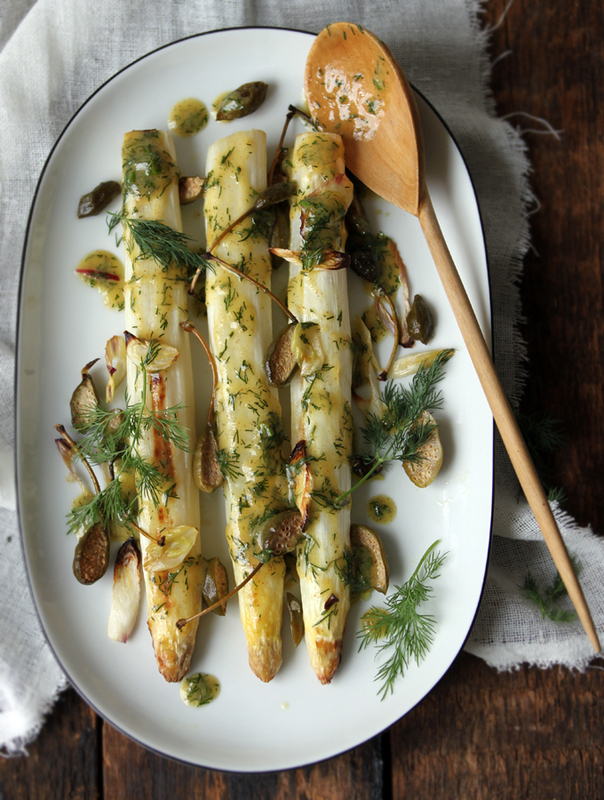 That dill dressing looks absolutely magnificent against the white asparagus! Also, now I want to track down some caper berries just so I can roast them, thanks to your endorsement. This is such a pretty side! Love this idea!